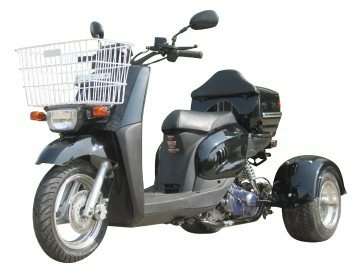 3 wheel 50cc ice bear trike on sale now. Buy yours today with no tax included! Honda cloned GY6 engine with electric start, automatic transmission, front & rear disc brakes. This is a street ledgal three wheel trike that will not require a license to operate in most states ( check your state regulations). The freedom utility scooter comes is equipped wikth under-seat storage and a free trunk is included. With no added or hidden cost this gas scooter trike can be yours for $1799.85. We are very gracious to gain you as a customer. Please sign up for our mailing list during checkout or on any page. We send several emails automatically to your inbox on the entire shipping process, step by step. We believe in keeping our customers in the loop and informed of how our process works every step to your door! We look forward to working with you and please feel free to send us an email at any time letting us know what you need! We are also available 24 hours a day 877-300-8707. Please contact us anytime you like with your service or sales needs! We are established and dependable- We have been in business for over 7 years and growing rapidly. For over 7 years, we have gained tremendous experience serving thousands of customers in high dirt bikes, go karts, and scooters. Our knowledgeable staff is enthusiastic, helpful and courteous; we have a great attitude and want your business. We care about our customers and make ourselves easily accessible. Our toll-free number is 1-877-300-8707. Your satisfaction is our #1 concern. Why get yourself all frustrated & try to get hold of a company never answers the calls? Pick up the phone dial our Toll Free 877-300-8707. We guarantee you will find the best customer services here you deserve.